First, I want to mention how much I love these covers; they’re absolutely wonderfully detailed and contain so much expression. I’m pretty much in love with all the art in this – the characters are consistent, and the world is very colorful and detailed. There’s a large panel early on with a two-page spread of a mansion party, and it’s astoundingly composed, with small details everywhere. The very first panel shows how BIG Minsc is compared to everyone around him, which is especially striking when he’s indoors. When the characters are little sprites on your screen, it’s sometimes hard to imagine how imposing someone like Minsc must be. 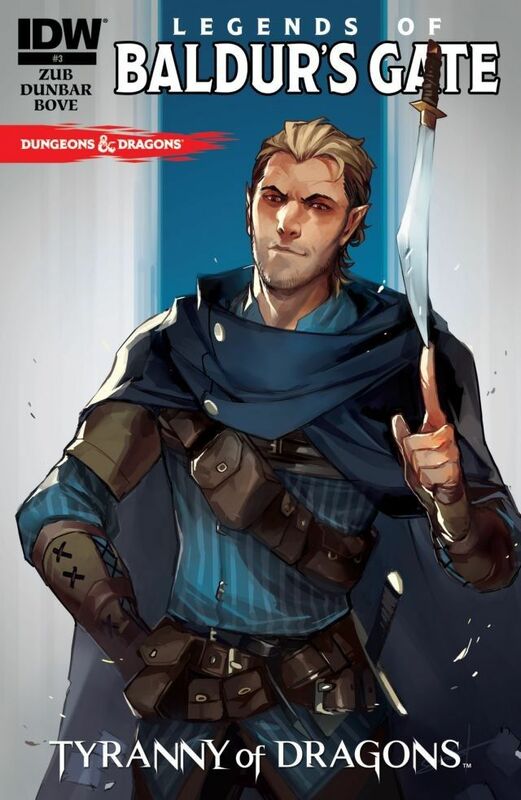 Our introduction to Coran, a party member in Baldur’s Gate, is through the eyes of his son, who is disgusted with his father’s ties to the nobles. He’s gotten a bit of a makeover between the game and the comic, but he’s instantly recognizable because of his green facepaint. There’s a lot of really funny lines in this one; I like the humorous, adventuresome tone this series is taking overall. It’s not taking itself too seriously, which is delightful. There’s a really cool, action-packed fight scene in this issue, with arrows, spells, fists, and swords flying everywhere. I also think there’s some great small moments/world-building going on, like having the guards not be superhuman and one goon snapping at another when he tries to tell him how the Sleep spell works. The comic AGAIN ends on a great cliffhanger – when is issue #4?! A technical note – I had been reading all my digital comics on an iPad 2, and I’ve now moved to a Kindle Fire. They still look amazing, even on the smaller screen.